Dana has a big heart and cannot turn her back when she sees an animal in need of rescue. She has helped all manner of creatures, and when she saw that pregnant cat in need of help eight years ago, she did not hesitate to take it home. She was there when the cat introduced five new kittens to the world, but, sadly, three of them did not survive. 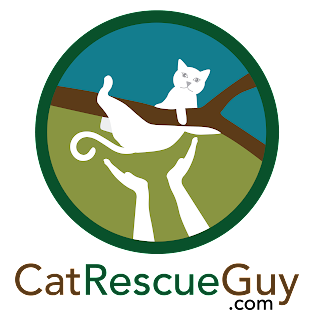 Dana kept the two survivors, one black and white, the other a gray tabby, and named them Sylvester and Tweety. Eight years later, the two brothers and their mama are still with Dana and are deeply cherished members of her family. 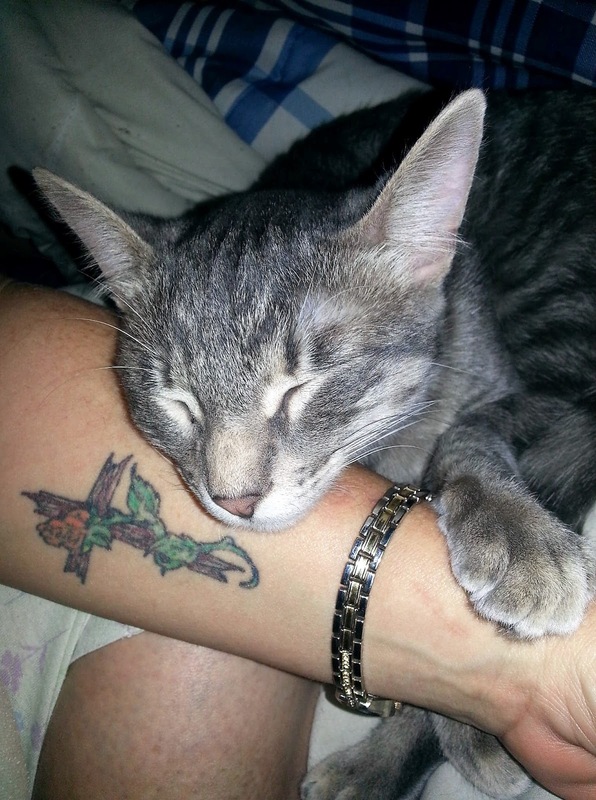 It was Tweety, the gray tabby, who recently caused so much worry and stress for Dana. Tweety is strictly an indoor cat, but someone left the door open, and Tweety decided it was time for an adventure. 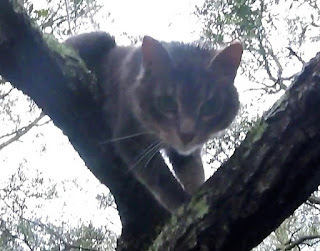 He climbed one of the many trees next to the house and quickly learned about one of his limitations that he had never faced before: he did not know how to climb down. He settled into a small crotch about 40 feet high near the top of the tree and cried down to Dana below. Dana tried to coax him down, but he was unable to figure it out. Thus began Dana's four days of torture as she struggled to find some way to get Tweety down. She called the Fire Department, Animal Control and anyone else she thought could help, but the only thing she gained from her efforts was frustration. The constant worry was taking a toll, and the stress of it all made it impossible to sleep. At last, someone told her about me, and Dana contacted me right away. I told her I would be happy to get Tweety down, but the weather was turning bad, and rain was expected all the next day. I told her that I would watch the weather and let her know when I saw a break that would allow me enough time to get there and rescue Tweety. The weather forecast was not promising, but as the day progressed, it began to appear that the latter part of the afternoon might bring a break. Once it became clear that the weather would be calm enough for me, I began driving to Dana's home out in the country near Gulfport, Mississippi, and I should have enough time before dark to complete the rescue. When I arrived, Dana was outside by the tree waiting for me. She pointed to Tweety up high near the top of the tree, and I pondered how I was going to reach him. 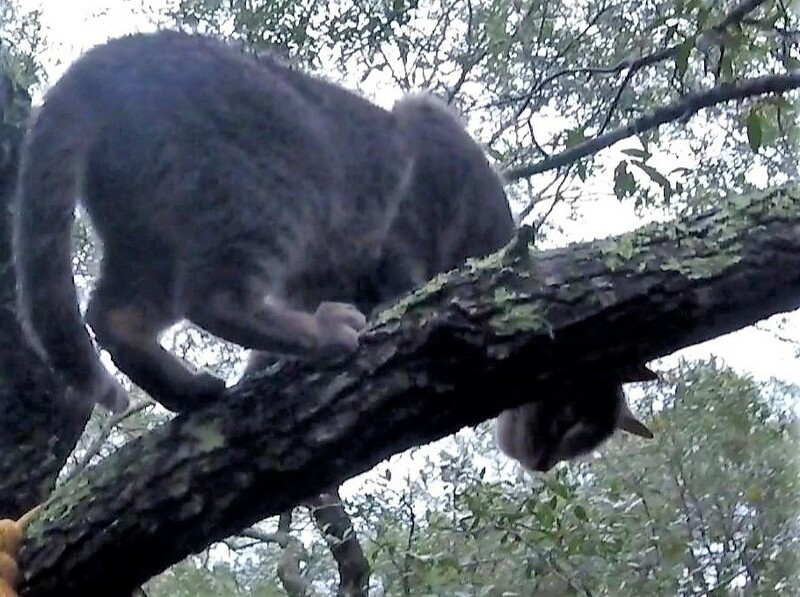 Tweety was at the top of a very long branch that angled out from the trunk at a 45 degree angle for a long distance before turning straight up. The only place to install my rope was in the crotch where Tweety was resting, and I was concerned about adding my weight at that point where it would have significant leverage on the branch where it is attached to the trunk. 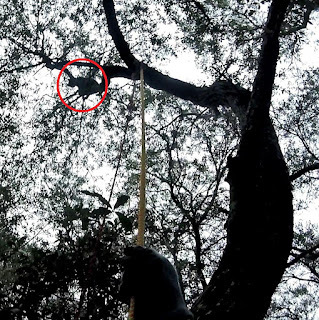 The trunk was clearly alive at that point, but it was also clearly long dead several feet above that point. I could not be sure how strong the attachment point was and if it could handle the added stress of my weight. There were no other trees tall enough and close enough to climb instead, so I decided to install my rope in the crotch where Tweety was and install a separate backup rope in a nearby tree to hold me in case the branch broke. Tweety handled the installation of my rope pretty well in spite of the difficulties I had. I had to shoot my weighted bag just over his head three times before I got it precisely located, and while the rope installation made him nervous, he had calmed down by the time I climbed up to him. Dana had told me that Tweety was a friendly, sweet cat, and I really needed that to be true, since I needed him to come to me. I would be able to reach up just to where he was, but getting any higher than that would be difficult and risky for me. 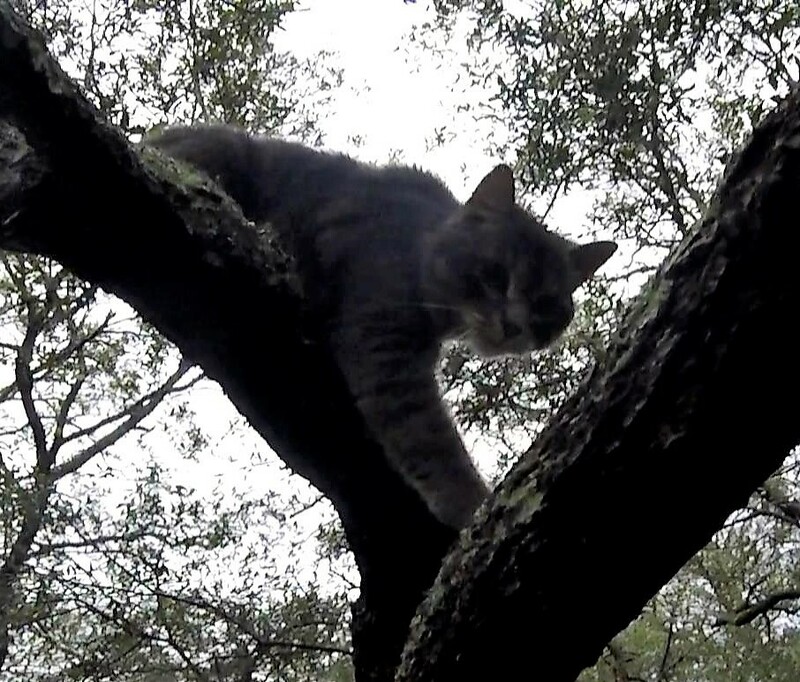 I climbed up to him slowly and gently, because my weight caused the top of the branch to sway quite a bit. Tweety stayed just a few feet away and watched me. Once I climbed up just as high as I could go, I reached out and talked to him. He studied me for only a minute before deciding that I was okay. He stepped down toward me and sniffed my outstretched hand. He let me touch his cheek with my fingers, and then we both relaxed. He came down closer into the crotch which is where I needed him to be. I petted him some more, and our friendship seemed pretty solid. I pulled up the carrier, opened it and held it up above my head for him to see if he would step inside. He was not disturbed by it, but he was not interested in it either. After a short break, I tried again with the same result. I opened a can of food for him, and he watched impatiently as I got it ready for him. When I held the food up to him, he took one of the biggest gulps I have ever seen by a cat. Two more gulps like that, and the entire can of food would be gone. I held the food up to him one more time while holding it in front of the carrier. Again, he took a big gulp, and then I placed the food in the back of the carrier. I held the carrier up to him, and he hesitated for a few seconds before stepping inside. Once he was all the way inside, I pulled the carrier down, closed the door and brought him down to the ground. Dana's torture was finally over, and the huge smile on her face as she came to get Tweety from me was priceless. That is what I love to see. She took him inside the house and released him there. After a little while, she came back out to return the carrier as I was packing my gear. The resolution of all the stress of the past four days finally overwhelmed her, and she cried as she handed the carrier to me. She thanked me profusely and gave me a big hug, as she said, "You don't know what all I have been through." But I do know. I don't know specifically everything that Dana has been through, but I know most of what people go through when their cat gets stuck in a tree. That's why I do this, and that is why it is so rewarding.